I had a breakthrough at fresh meat. While stopping in any traditional sense is still a work in progress, we’ve finished learning all the falls, and I’ve come to realize that when great speeds are attained, falling to one’s knees is the quickest way to stop. My confidence shot through the roof. Then, this past week we scrimmaged. While it was exhilarating to say the least, my body has a long way to go to catch up to my mind: Even though I feel I know exactly what I should be doing, that doesn’t mean I can actually do it. I’ve been really interested in what drew these various women to ToRD’s fresh meat program, but as the weeks go by, it is becoming obvious that they are probably just as interested in what I’m doing there. I’m not the only guy, there are two others, both of whom are doing fresh meat alongside the referee training, but we stand out. I’ve got a stock answer set to respond to the inquiry: I write about roller derby and feel like I’m at that stage where I need to know it from the inside out. And that was the motivation. I have an extraordinary amount of respect for roller derby referees. The men and women in stripes who police this sport—as with other sports—don’t get a lot of respect. They get ridiculed by the crowd, harassed by the skaters. In the states, Queen of the Rink recently released a blog post called “How referees are killing flat track roller derby,” which argued for a reorganization of officiating in flat track roller derby. While I do think the sport is going through some growing pains (it is only 8 years old, don’t forget) and should be constantly refined, for the most part the refs want to do their best, and, I think, succeed just as much as the players do. And of course, without them, there wouldn’t be a game. That being said, I’m not particularly interested in refereeing. That’s not the relationship I want to have with this sport. Another thing that comes up (from freshies and skaters alike) is the possibility of starting a “merby” league. While I’d be lying through my teeth if I said I’d never thought about playing in a bout, I’m still not sure about my relationship with men’s roller derby. Although a few years ago it would have been absurd to think of men playing this sport on any scale of note, it’s a reality now that can’t be ignored. From all-men or co-ed scrimmages at Roller Con to the ever burgeoning Men’s Roller Derby Association (formerly the Men’s Derby Coalition), men’s roller derby is coming and it is coming fast. The Mens Roller Derby Association was formerly known as the Mens Derby Coalition. The Men’s Derby Coalition formed out of that same initial explosion of North American roller derby in 2007. In 2006, it was actually fairly easy to count the number of women’s leagues playing flat track roller derby (there were about 30); by the summer of 2007 the sport had spread considerably and had grown beyond its American roots. By 2007 roller derby had come to Canada. If you talk to anyone who was inspired to begin playing or forming roller derby leagues in those days, they all cite the same influence: the A&E series Rollergirls. The skaters of the Lonestar Rollergirls were a diverse bunch from a variety of fields who shared similar, attractive features: fiercely independent, athletic and strong, but also unabashedly feminine. Rollergirls presented more than a sport, it presented an attitude, a way of life. That the show was remarkably appealing to a 21st century woman should not be a surprise, and it probably shouldn’t be that much of a surprise that it influenced scores of women to follow suit. Playing banked track roller derby was a pipe dream for most, if not all, who were inspired by the sport. So when those first wannabe skaters began to research the possibility of playing, they inevitably encountered what was still known as the United Leagues Coalition (and later WFTDA), and the other girls in Austin, the flat-track playing Texas Rollergirls. The show aired in Canada as well, and the same wave of formation followed. Out west Edmonton’s first league, the Oil City Derby Girls was forming, while in British Columbia the skaters who would form the Terminal City Rollergirls were beginning to organize in Vancouver, and a group of women in Victoria were coming together as the Eves of Destruction. Back east, in Hamilton, Toronto and Montreal, like-minded women were finding each other all with the same idea: to start a roller derby league. The first organized league bout in Canadian flat track history was played by the Hammer City Rollergirls in 2006. On July 22nd, 2006, the newly formed Hammer City Roller Girls played the first official organized flat track roller derby bout in Canada when their Steel Town Tank Girls took on the Hamilton Harlots in Burlington, Ontario. While the importance of this date in Canadian flat track lore is undeniable, it could be the events in Toronto less than a month later that may have had the greater influence. Toronto Roller Derby formed out of a merger and reorganization of two independent teams, the Toronto Terrors and the Smoke City Betties. To facilitate the development of a league (and to help with the growth and understanding of the sport in wider circles) the Smoke City Betties organized the Betties’ D-Day, the first ever inter-league roller derby event to be held in Canada. On August 19, 2006, Hammer City, Montreal, and five of the six original ToRD teams were all present to play in a series of mini-bouts. While loosely set up as a tournament, the event would prove to be more important as a networking and training event. The Hamilton Harlots (as they would in most cases in those early days) dominated the day, defeating the Death Track Dolls, the Steel Town Tanks Girls, and Montreal in the mini-bout portion of the tournament, before taking down the host Smoke City Betties (79-57) in the main event. This Betties D-Day was a taking-off point for eastern Canadian roller derby. Hammer City would form Canada’s first travel team (the Eh! Team), Montreal would head back to Quebec and form their first home teams (Les Contrabanditas and Les Filles du Roi), Toronto would add the Gore-Gore Rollergirls to form what, at the time, was the largest flat track roller derby league in the world. By the beginning of 2007 all three leagues would be fully organized and in full swing, opening the doors to the public and beginning their first seasons of roller derby. Others in Ottawa, the GTA and London had taken notice and were following suit. Betties D-Day, held in August 2006, was a seminal event in Canadian roller derby history. Roller Derby folk like to toss around the word “revolution” when they talk about their sport (half ironically, of course), but in many ways the quick growth of flat track roller derby really does fit the definition. An entirely new sport created for women, by women that would feature women. Nothing like it had happened before. Over the 20th century women had become increasingly involved in pre-existing men’s sports, but with flat track roller derby, they’d created their own. It is perhaps because all of this that I am uncomfortable playing men’s roller derby. I still can’t help but think of roller derby spaces as women’s spaces, the sport itself as a women’s sport (and I mean that politically, not physically). But even on this point, I am heavily conflicted, and my opinion is slowly changing, as are the opinions of many in the sport. When I first discovered roller derby, I wholeheartedly bought into the idea of it being an extension of the riot grrrl/third wave feminism movements that had swept through North America at the end of the 20th century, and it certainly was a major influence (Steel Town Tank Girls!). But as time passes and as the sport evolves, this categorization seems awfully limited, dated even, of another era: The sport has transcended such classification. I just don’t see that reactionary anger in roller derby; I don’t see skaters out there trying to undermine any pre-existing paradigms; I don’t see women who feel the need to fight for something (respect, recognition, whatever) that they feel they deserve. And while I think all skaters demand that their sport be viewed as a serious, physical, athletic endeavour, I don’t think many are too concerned with falling into the rigid parameters we have set for what has traditionally been called a “sport.”And that is probably what sets roller derby apart from the too easily defined feminist movements of the 1990s; skaters are too focused on developing their game to be engaged in some last-century battle for acceptance. The 21st century rollergirl doesn’t fight for equality, she expects it. That’s a wonderful take on both the origins of Canadian roller derby, as well as the place for Merby. Nice shoutout to the Zebras, too. Reading the Nerd Meat posts, I’m starting to feel as though I’m going through fresh meat, too. Don’t forget that in 2007 Hammer City came to New Jersey and played the She Devils. Toronto referees almost played the Hooligans (PJRD’s men’s team). And this all ocured during the Philadelphia Warriors Re-union/Roller Derby Hall of Fame event. That would have been awesome, but the men’s game didn’t happen at that time. Our men’s team formed early 2007. Thanks for that! 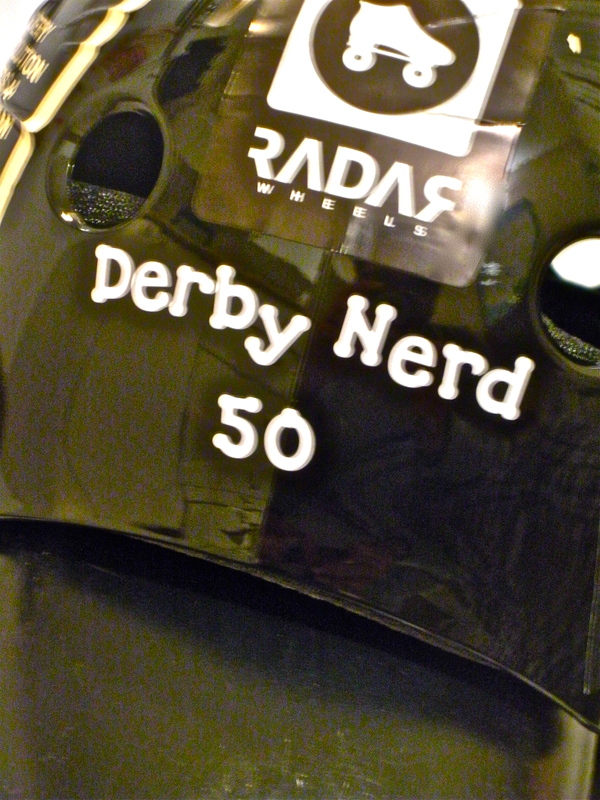 And don’t worry Part 5 focuses on those early days of HCRG awesomeness.